Gluten free and dairy free brownies? Oh yeah! I don't think you could tell the difference between these and gluten filled brownies. They are super simple to make in the Cuisinart with this one bowl recipe. Note: The cocoa you use will be the biggest impact on the flavor of your brownies. Please don't skimp!. Higher quality usually also means higher cocoa butter content (approx 21%-24%) in the cocoa which can impact the texture off the brownies. 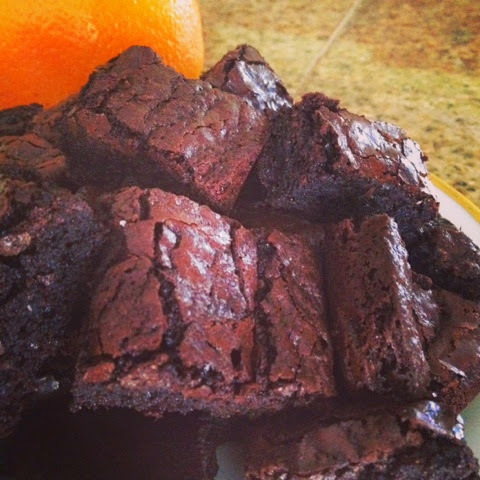 I used Pernigotti cocoa in the brownies in the video. Pernigotti is a dutched cocoa from Italy with loads of vanilla flavor because they grind whole vanilla beans right into the cocoa. I've also had great luck with Rio Cocoa which is just slightly dutched as well as Callebaut natural cocoa. Whichever type of cocoa you prefer will work in this recipe. Chill coconut oil until hard, then chop. Add to sugar in food processor. Pulse until it looks like crumbs. Add eggs and salt. Whir until it is well blended. Add cocoa and orange zest. Pulse until just blended. Add flour. Pulse again until just blended. Bake at 350 Fahrenheit for 35 minutes. P.S. Happy Birthday to my sister Sonja who inspired me to create this recipe. P.P.S. Special thanks to Valerie who taste tested this recipe.